cent increase — to 52.2 million metric tonnes of e-waste by 2021.
a comprehensive system to address these challenges. (32%), Refrigerators (27%) and TV (22%) accounted for the bulk of e-waste. Computers and mobile phones constituted 2% and 1% respectively. 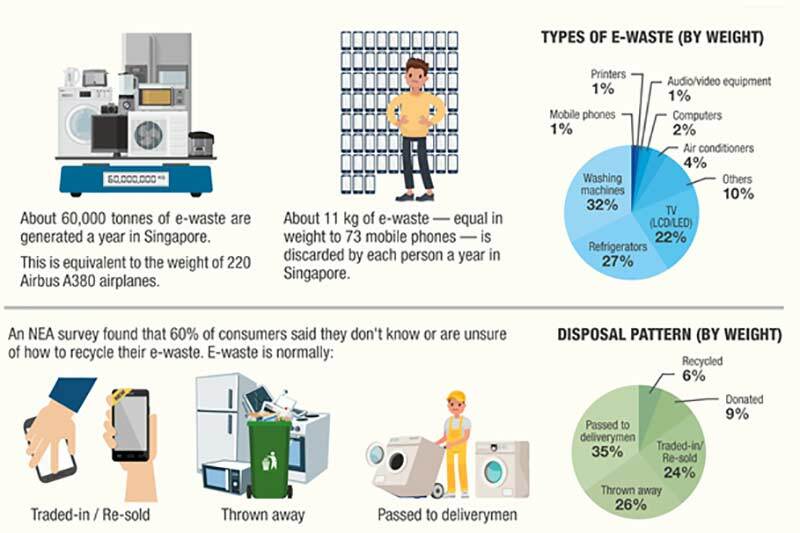 Singapore residents do not know or are unsure of how to recycle their e-waste. result, only components of significant value are recycled. contributing to global warming and climate change. the incineration ash which is landfilled at Semakau Landfill. proper recycling and treatment processes are adopted. technology (ICT) equipment, which is a small fraction of the total. stakeholders in the e-waste management system are assigned responsibilities. collection targets and channelling the e-waste collected to formal recyclers. on e-waste via a consultation session in February 2018.